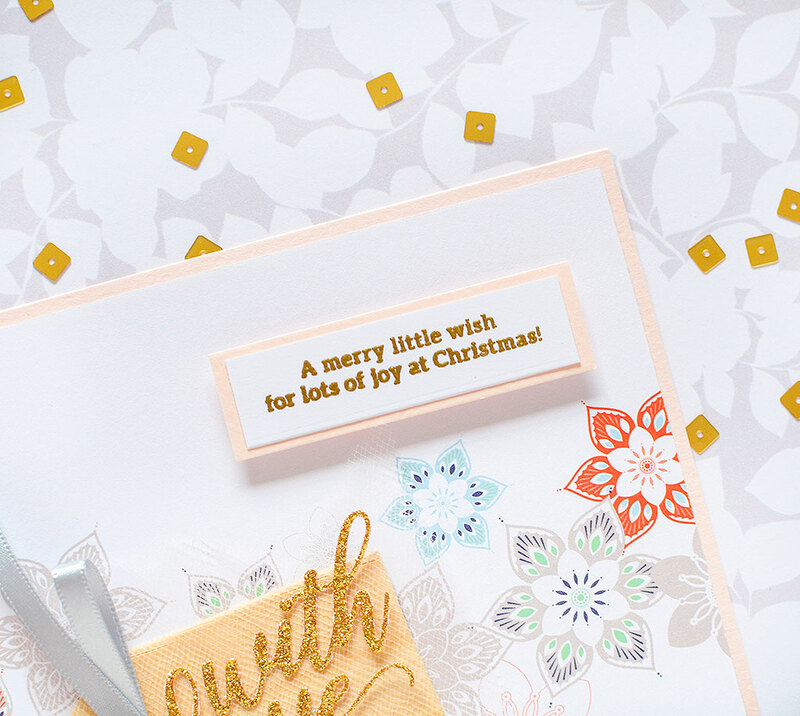 Hello and welcome to Day 1 of the Pinkfresh Studio Holiday Cards Blog Hop! You are guaranteed to be inspired by one (or all) of the cards you see along the way and then you can get a jump on your own card making for this busy season. 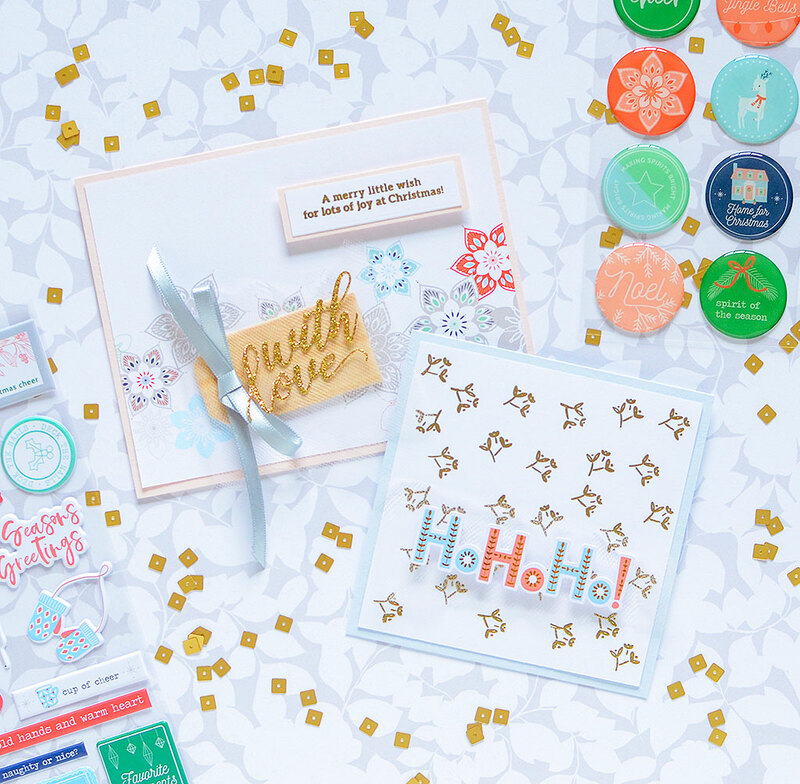 We're using stamps and dies from Pinkfresh's Holiday stamp and die collections--be sure to check out that section of their shop if you haven't already! A couple quick things to mention before we begin...If you're following along with the hop, you should have arrived here from Nina Tripani's blog and you'll go on to Sharon Harnist after me. You can always head back to the Pinkfresh Studio blog if you get lost. (Plus, they have ALL the info, hop participants, giveaway photos, etc.) This is a 2-day hop, so you'll find a whole new group of inspiring gals tomorrow! Now, let's get to it! I'm starting with a wintry card featuring the mittens stamp from the Skating Bunnies stamp set. I stamped white cardstock with different colored mittens in red, coral, and orangy-yellow. It's not a traditional holiday color scheme, but I think it's definitely a transition between autumn and winter and I personally wouldn't be afraid to use it for Christmas cards! I added a few enamel dots from the Holiday Vibes scrapbook collection, as well as some fabric and white pom pom trim, which is symbolic of snow. The final touch was the 'cold hands and warm heart' puffy sticker from the same collection, and a gold heart from Simple & Sweet. This is a great card for friends who don't celebrate Christmas, or late birds like me who can never get cards out on time! My next card has a Let It Snow patterned paper background with these ornamental snowflakes. The paper is the scaled down version from the 6x6 paper pad and it's just perfect for cards! 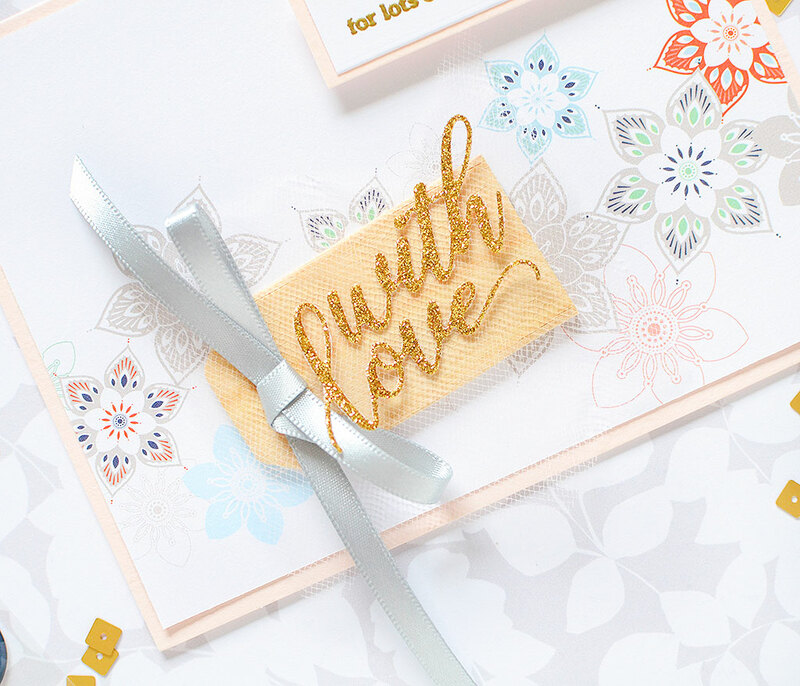 I paired it with a wood tag decorated with tulle, a silver-gray satin bow, and 'with love,' which I made with the Do All Things with Love die from the October Stamp and Die release. It goes along with a sweet Christmas wish found in Train Ride. I embossed it with gold embossing powder and matted the message to a piece of blush pink card stock, which matches the card base. My final card features another allover background pattern, but I stamped and embossed this one in gold. 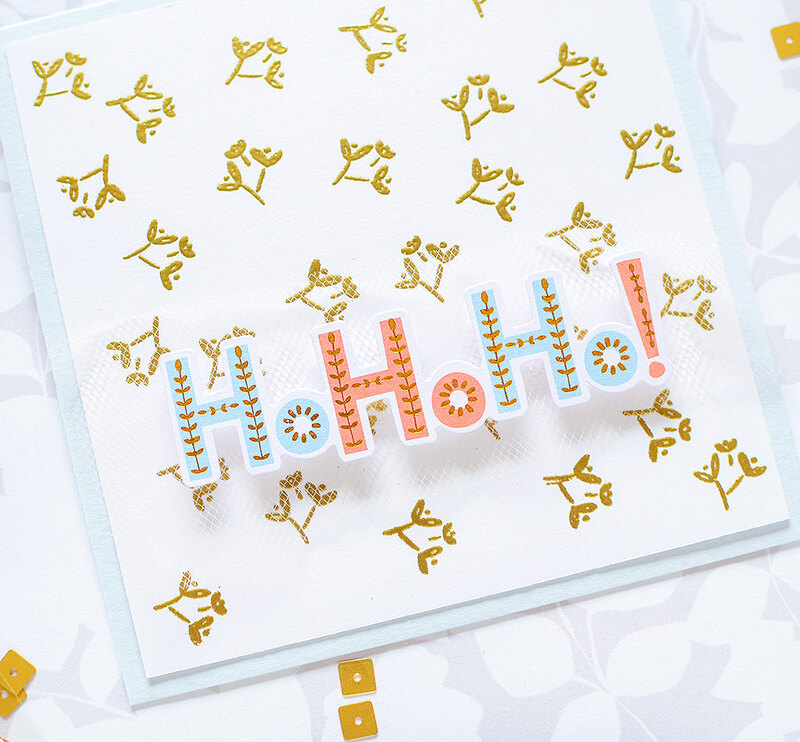 I wanted to use the 'Ho Ho Ho' die cut from Holiday Vibes, which is inlaid with a gold foil leaf pattern. I chose a similar image, this 3-leaf flower found in the Great Joy stamp set. The small accent stamps like that flower and the mittens from the first card, are often some of my favorite stamps. I love patterned paper, but in some cases, when the perfect paper just can't be found, it's fun to make my own with the little stamps. I finished the card off with some tulle and the 'Ho Ho Ho' die cut. This is definitely a non-traditional color scheme off peach, gold, and powder blue, but I kind of love it; how about you? That will do it for me, especially since I know you've got lots more to see! I have a few more Hop details to share and then you can get on your way to Sharon Harnist's blog! - Winners will be chosen and announced by 2pm CST on November 11th, 2018. Winners will be posted on the Pinkfresh Giveaway page. You must check to see if you've won and contact Pinkfresh within 2 weeks to claim your prize. - Not a winner? No worries! 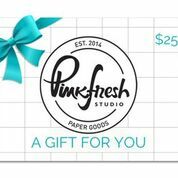 Earn a FREE Holiday Vibes die with ANY purchase at the Pinkfresh shop while supplies last. No code needed; the die will be automatically added to your cart. Ok, folks! Thanks so much for stopping by! I always love it when you're here! Rebecca, your cards are positively gorgeous...fresh, crisp, festive...the kind that captivate my CAS-loving heart! Wonderful to see the 'little images' get some time on the stage. The mittens, especially, catch my eye; I could use a pair, in each colour to wear in real life. It's cold here in Alberta! Christmas spirit soaring in seeing your inspired, inspiring delights! Such pretty cards!! I love using little stamps to make cards. I think they make some of the best cards!! Rebeca, tus tarjetas son maravillosas como siempre tu inspiración es luz para mi te sigo y admiro pues con disposiciones tan simples logras cosas maravillosas. Ame cada una de tus tarjetas que no se cual escoger pero quedé impresionada con la belleza y la simplicidad de la HO ho HO besos y saludas como siempre un placer leer tus entradas !! Your style is so distinctive and designs always gorgeous and fun. Thanks for the inspiration! Both cards are lovely, and find the white pom pom trim on your first card a nice touch! Your color palette is so wonderful. Soft and yet cozy. All three are beautiful, I love the addition of fabric. Nicely done. Very cute! And love the layouts on all of them but especially the snowflakes. How adorable!! Lovely designs. I love the use of ribbon and pom pom fringe, so fun! Love the 'ho ho ho' and the beautiful design on it. Awesome cards, tfs. That's a lot of work you put in on your gorgeous cards!!!!!! Thank you for showing these very pretty cards. I love your mitten card! So pretty and unique colors! Cute card designs using the smaller stamps--love the mittens. Love the design against the fresh, pale blue. And the trim really brings out the other card. Love them both. Wow, love the stamped background. This is something I really want to get into, thanks for the inspiration to just go for it. Oh and those white pompoms - adorbs! These are adorable cards. You reminded me that the little stamp images can often make a big impact in a design. Your cards are so cute and creative! I especially love the unique snowflakes and the sweet mittens. I love ALL of your beautiful, delicate cards! Each image has so much beautiful detail and color. Each one is perfection! Your cards are so sweet! Love the whimsy of each of them. Love your adorable cards and great designs! Thank you. These are such creative designs. Love the gold. What darling cards Rebecca, the colours are so soft and beautiful and really shows off the gold embossing. Very nice work on all of them! The mittens are my favourite! Love the cards you have created. 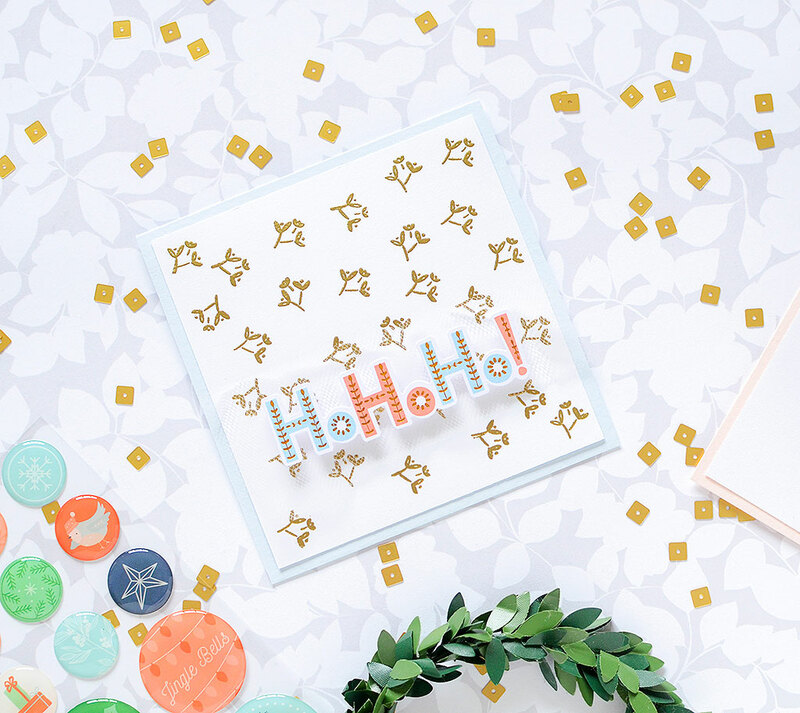 These are adorable holiday cards! Thank you for sharing! Gorgeous cards! Love the backgrounds! Your cards are soooo cute!!! These are really sweet, you made some lovely designs there! Thanks for the inspiration. These cards are really gorgeous. Love the use of the small stamps and the beautiful colours. Love the sweet whimsical feel of your cards! Gorgeous designs! I really like all three of your cards. The way you used small images to create a background is great. I need to remember to try doing that more often as it seems I seldom find background paper I want to use. Thanks for the reminder. I love the colours you chose to put together as well. Love your sweet and delicate card style--really cool. Thanks for sharing! Love how you created a background with these stamps! These cards are so sweet! i love the mittens and that you used tulle on the cards, what a fun idea. Gorgeous cards! That second one is my favorite - the paper is so sweet and pretty, it's the perfect cut! 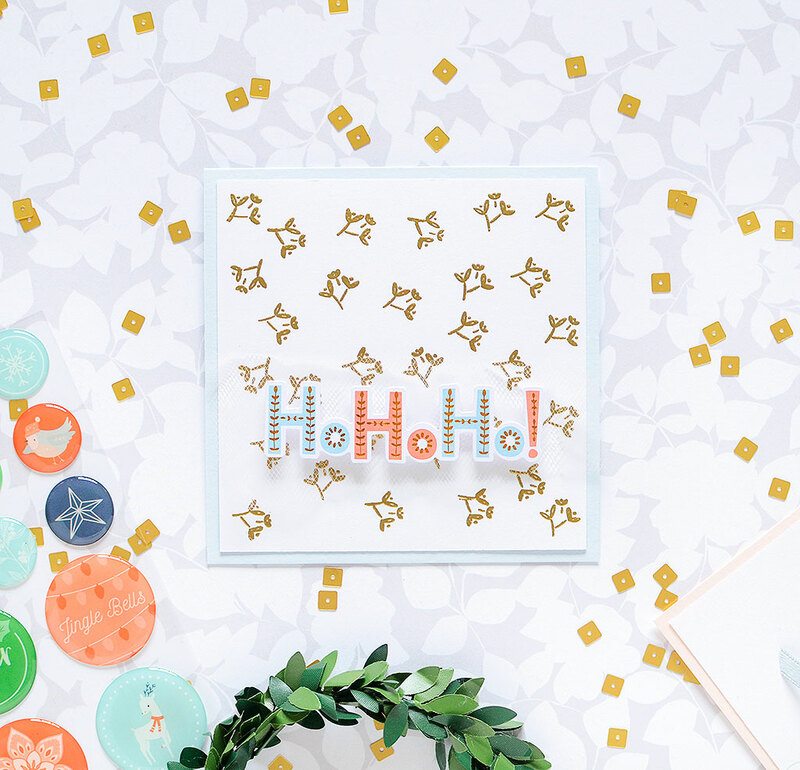 These cards are so light and airy...love the Ho Ho Ho one! Hello there Rebecca. Such pretty cards - I love them all, and they are different from all the others. It's so nice that you all have such different ideas and give us so much variety to inspire us. Wonderful cards! So full of fun and merriment. Love the fresh CAS look. Super fun cards! I really like how you went with non traditional colors and how you used tulle for extra texture! Love these cards, especially the "with love" one! Your choice of non-traditional colors is refreshing! Really great cards! Love the addition of the pompoms! All three of your cards are awesome! I love how you created your own backgrounds, used tulle on all of your cards.... And that they are square, in a very good way! Beautiful cards - I love the mitten card the most! 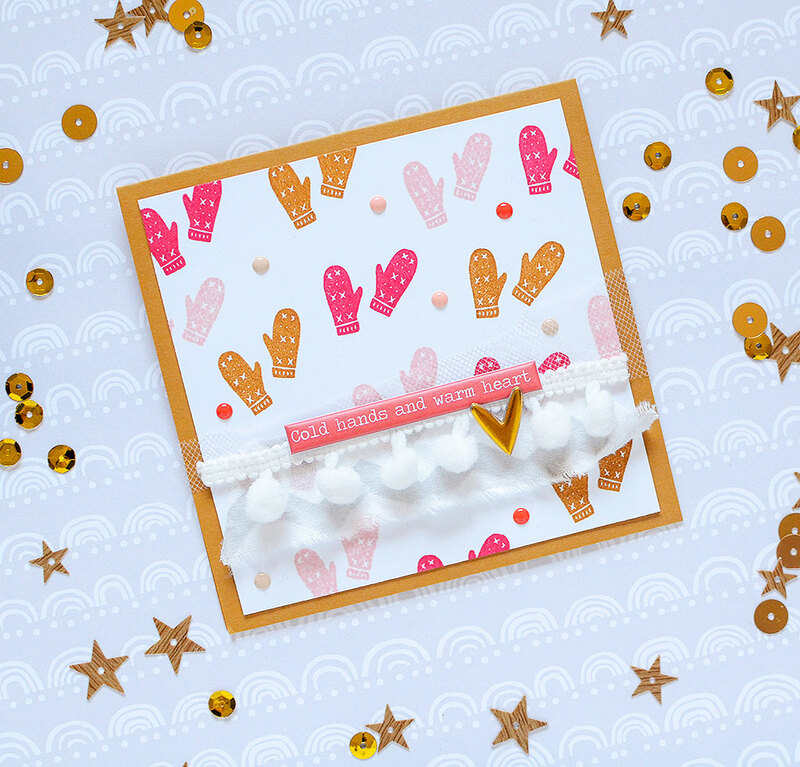 Adorable cards and I love the backgrounds along with the fun embellishments. Great job. What creative and cute ideas. Love the designs and dimension. So pretty- love the tulle on the tag! I just love the look of the flowers on the second card, very vintage, and oh so unique!! Great job! Delightful cards! I love the background on your HoHoHo card, and those mittens are absolutely adorable! Lovely cards! Your color choices are beautiful, and I like the touches of tulle and ribbon on your cards. I often overlook the smaller stamp images in a set, but you've inspired me to look at them in a whole new way. Thanks! Sweet cards!! Love the pompoms!! I love the soft colors of your cards. Love the Ho Ho Ho Card. I can't decide which card I like best! They all stand out. I just love the colour you choice. Stunning! Such wonderful cards. I adore the color choices!!! 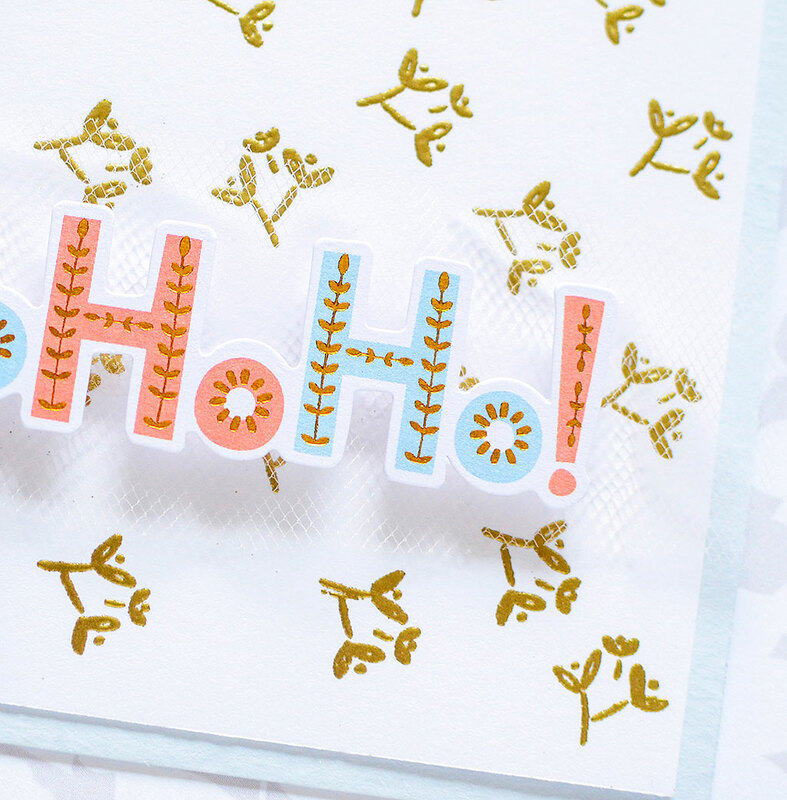 Oh, I love that Let it Snow patterned paper. Now I want stamps of that too! I also love how you used that color palette; it's definitely not one I would think of, but you made it work perfectly for the holidays. Thanks for sharing! Wonderful cards! The mittens are so cute and the ornamental snowflakes on the second card are so pretty. 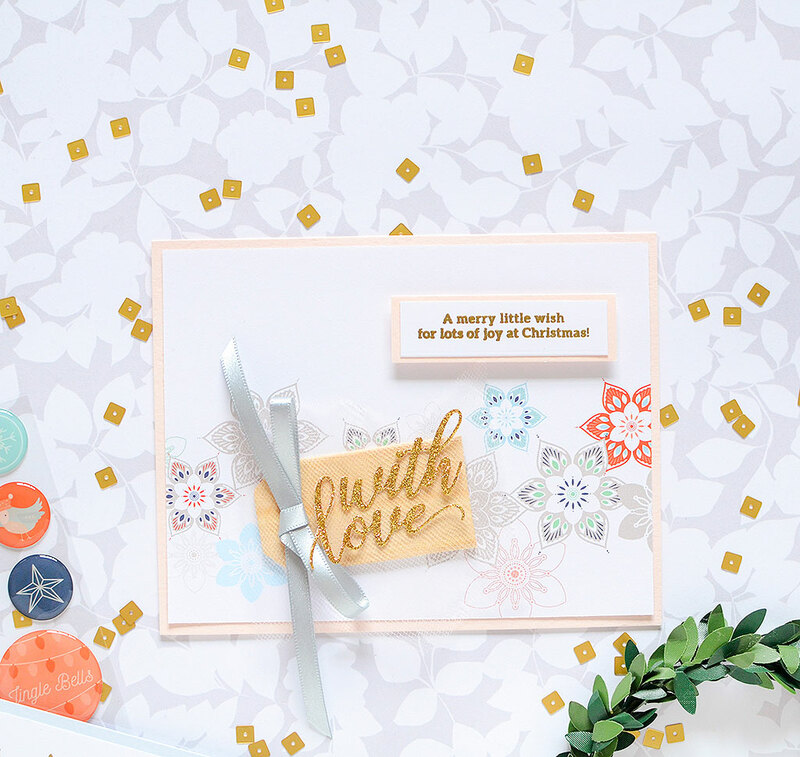 Love how you created a background with the tiny gold embossed flowers on the last card! OH wow! Your color combos are incredible!